Olivia and Jodie from Berkshire decided to try something new during their autumn visit to The Pierhouse. Caroline, our Operations Manager, organised an end of season day's fishing for the ladies at nearby Inverawe Angling School. 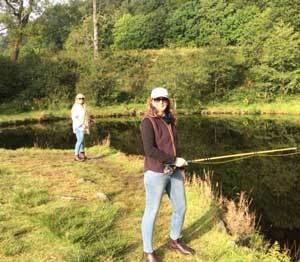 Having never fished before, Olivia and Jodie had no idea whether they would enjoy the experience...but they did. Well and truly 'hooked' on the whole challenge, the ladies were able to completely switch off from their work stresses and just fish! 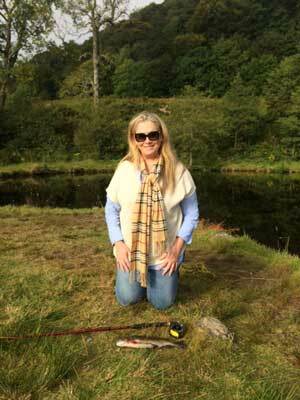 Olivia said "Many thanks for arranging our fishing at Inverawe. We had a wonderful time and, as requested, have attached photos of our catches!" Inverawe Angling School offers lessons showing people the basic fly fishing techniques including how to tie a fly onto a line, casting and how to despatch your fish. There's plenty of time to practice with an instructor on hand to advise. The fishing season may be over for the year, but there are plenty of winter outdoor activities in the area - take a look at our activities pages for ideas....or get in touch with Caroline here in the hotel who will be delighted to organise your chosen activity.